Nowdays,it`s necessary to have the foundation to obtain visa to Ukraine for countries which have a visa regime with Ukraine. The invitations executed according to the Ukrainian legislation and issued by the competent authorities can be the reasons to obtain visa to Ukraine. If the foreigner intends to visit Ukraine for tourism purposes "temporary entry to Ukraine from the country of permanent residence in the health, educational, workers - business or other purposes without the exercise of gainful activity in the seat" (the Law of Ukraine "On Tourism") is hosted by Ukrainian touroperator with a corresponding resolution for the issuing of documents for obtaining short-term visas to Ukraine for tourism purposes. In a reason,if a person has the intention to visit Ukraine for business purposes, this invitation is issued by the State Immigration Service of Ukraine, on the basis of competent data submitted by the competent entity on the need for the alien arrival. 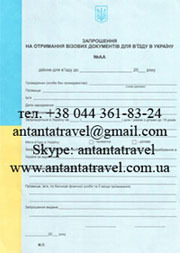 If your host is an individual - that an invitation is issued by the authorities of the State Immigration Service of Ukraine. Also it may be requested documents which prove ties of relationship with a foreign national, or may be taken the receipt of responsibility. The above-listed invitations are not the reasons for the foreigners to enter the Ukraine, and are the only documents that are submitted to the Embassy of Ukraine abroad, for a decision on issuing the visa or not. No matter who is the host - a legal or natural person, after receiving permission, they are accountable to the law enforcement agencies, in accordance with the rules of the foreign citizens on the territory of Ukraine, and they may be tested at the initiative of the competent authorities.